They no longer say they are "living in Delhi". Thousands of Delhi residents who have to breathe its unhealthy air prefer to say that they are "dying in Delhi". The fear is for real. The capital's tree-lined avenues, grand colonial buildings, historical monuments are all submerged in the smog of anger and helplessness. "I am sick of it, but I don't have a choice. Every day I go back home with a cough. Something needs to be done about it," says H R Kidwai, director, Jamia Milia Mass Communication Research Centre. Praveen Malhotra, a career counsellor, feels no different: "After the pollution in Delhi, I think we can even survive a Holocaust. And the worst affected are the children." Children or adults, rich or poor, such doomsday scenarios are playing on the minds of thousands of Delhi's denizens today. According to a recent poll conducted by mt-imrb , in five metros - Delhi, Mumbai, Chennai, Bangalore and Calcutta - a sizeable portion of the 2,040 respondents said they would like to move out of the city. Delhi and Mumbai topped the list: 41 per cent and 37 per cent of the respondents wished to settle elsewhere. Of those Delhites who wanted to move out, 38 per cent said the reason was "quality of life", while 50 per cent said it was for health concerns. The Delhi-based Centre for Science and Environment ( cse ) conducted an extensive study, the first of its kind in the country, to estimate the rise in pollution load from the industrial and transport sectors in the entire country. The results, ghastlier than expected, reveal that the rate of pollution has far overshot economic growth. It is true that the country's Gross Domestic Product ( gdp ) has gone up by 2.5 times between 1975 and 1995, but at what cost? Vehicular pollution has escalated by a shocking eight times and, in the same period, industrial pollution has quadrupled (see graph: Wither wealth? ). The cse figures could only be underestimating the country's plight. The study covered only two aspects of pollution: vehicular and industrial. It does not take into account pollution from thermal power plants and agriculture, or that from households, especially urban. If it did, the cse estimates would have been higher. The purchasing power may have increased but so have the health hazards. Now, the adage, "Health is Wealth", lies buried in the smog that engulfs the entire country. Diseases and deaths: the words say it all. Citizens are dying of respiratory and cardiovascular diseases much before they are able to enjoy their accumulated wealth. Clearly, vehicles are the biggest culprits. According to the cse study, in 1995 the pollution load from vehicles in India was 5.789 million metric tonnes, compared to industries' share of 1.996 million metric tonnes. Of the country's vehicular pollution load, Delhi accounts for almost 10 per cent. The number of registered vehicles in 1995 in India was 30,287,000, of which 2,575,731 were registered in Delhi. As for the contribution made by industries, even "liberalisation" did not quite help India. It was in the late 1980s and early 1990s that the Indian economy opened up in the name of liberalisation. A greater share of the investments came to the electronic and software sectors, which are considered less-polluting. The traditional, more polluting industries went down further in the scale of priority. These industries were already suffering from a chronic lack of funds and obsolete technology. And with no finances available to invest in pollution control technology, they continued to pollute all the more. Another indicator of the country's economic state, besides industrialisation, is urbanisation. But growth in urbanisation has also come as a bane. During the two decades under study, many small towns have emerged as industrial centres sans any parallel growth in civic amenities and pollution control mechanisms ( Down to Earth , Vol 7, No 13). Take, for instance, the dyeing industry in Tiruppur, Tamil Nadu. Here, the rivers too have been dyed, groundwater contaminated and vast stretches of agricultural land ruined. The lesson, which is still not learnt, is that industrialisation and urbanisation have only made life more miserable in a small town as well as a bustling metropolis. India, however, has not seen a concerted government effort to understand the severity of the problem. The industries are minting money while the government is busy addressing more "pertinent" issues. All along, a majority of Indians continue to die a slow death. The automobile bug has bitten Indians. And why not? Hyundai, Daewoo, telco , Honda and Fiat, to name a few, are coming up with the most buyer-friendly (read diesel), not necessarily environment-friendly, cars. Besides the luxury cars being introduced by the world's top car manufacturers, there are of course the desi two-wheelers models which have registered a record increase of 22 times in the two decades under study. There is an attempt to dieselise the fleet of motorcycles also. Royal Enfield is trying to reintroduce its diesel model. Meanwhile, the government has not spared a thought for clean air. It advocates an almost unlimited use of diesel, and norms on technology -- imported or domestic -- are totally inadequate, set mainly to support industrial interests. The result: pollution load has soared by eight times in 20 years. cse 's estimation of vehicular pollution load took into account data on the number of registered vehicles in India for different categories of vehicles, the daily use of these vehicles (km/day), fuel efficiency (km/litre) and emission levels (gramme/litre). 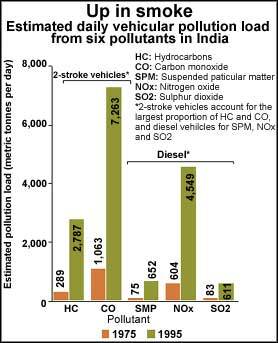 Results of the study showed that vehicles were releasing an estimated 15,862 metric tonnes (mt) of pollutants every day in 1995 compared to 2,114 mt in 1975. Carbon monoxide ( co ) topped the list, followed by nitrogen oxides ( no x ), hydrocarbons ( hc ), suspended particulate matter ( spm ) and sulphur dioxide ( so 2 ). hc levels were 10 times higher in 1995 compared to the 1975 level (see chart: Up in smoke ). The dramatic rise in two-stroke vehicles, which include two and three-wheelers, is responsible for the large quantities of hc and co in the atmosphere. In 1995, there were almost 21 million scooters in India compared to just 946,000 in 1975 - 22 times more than the number in 1975. Most of these two- and three-wheelers plying on Indian roads are supplied by Bajaj Auto Limited. The company has a virtual monopoly over the two-stroke market in India (see box: Wheeler dealer ). In 1975, 42 per cent of the vehicles on the road were two-stroke, but, in 1995, their number went up to a whopping 73 per cent (see chart: Sharing highways ). In these two-stroke vehicles, nearly 20-25 per cent of the petrol remains unburnt, thus releasing the pollutants directly into the atmosphere. - In Delhi, consumption of diesel has completely overtaken that of petrol. Between 1991 and 1996, it went up by 60 per cent compared to 34 per cent for petrol. A study conducted by the Central Pollution Control Board ( cpcb) shows that in Delhi, nearly 40 per cent of the spm on average is pm10 or smaller. - Though the quality of diesel used in Delhi is much better than any other Indian city, when compared to the best diesel available in the world - Swedish diesel - its sulphur content is 250 times higher. Particles emitted by diesel are coated with highly carcinogenic polycyclic aromatic hydrocarbons ( pah s ) . Even the World Bank, Air Resources Board of California and Germany's ministry of occupational health have categorised pah s as carcinogenic. Recently, one such pah , nitrobenzathrone, was analysed by Japanese scientists to be the strongest carcinogen found till date. Another powerful mutagen known to exist in diesel is 1,8 dinitropyrene. The government has, however, encouraged the use of diesel by lowering its cost substantially compared to petrol. And there is talk of reducing the price further. Besides, there are no emission norms for diesel vehicles and no question of improving engine technology. At the current rate of growth of pollution load, "air masks" will soon become a medical necessity. - In 1988, the industrial pollution load in India was six times higher than that in Indonesia and almost eight times higher than in the Philippines (see box: Carrying the load ). In the 50 years of independence, many small towns have also registered a phenomenal industrial growth. The textile industry is taking its toll in Tiruppur, Tamil Nadu, while Kanpur in Uttar Pradesh is falling prey to the wastes from the tannery industry. In Bokaro, there is more than a "little bit of steel" in everybody's life (see box: Bokaro ). And Asia's so-called largest chemical zone in Gujarat is an amalgam of hazardous industries at close quarters, not only making the air a cocktail of different gases but also filtering the metals into the soil and water (see box: Lethal overdose ). The cse study to quantify the extent of industrial pollution is perhaps the first such study carried out in India. The wb model, on which the cse estimates were based, differentiates air and water pollutants into six categories: linear toxicity (an average of 312 toxic emissions from industries), heavy metals (an average of different heavy metal emissions from industries), biological oxygen demand ( bod ), sulphur dioxide, particulate matter and suspended solids. The total pollution is estimated as a combination of these six pollutants. The wb model uses two sets of data. Firstly, it takes into account production in the 21 industrial sectors listed under the International Standard of Industrial Classification for the year 1975 to 1995. For India, the data were obtained from the Annual Survey of Industries reports. Secondly, the model takes into account the amount of six pollutants emitted in the us from each of the 21 industries in 1988 per us $1 million worth of production. In addition to the above data, Indian price indices and us exchange rates for the relevant years were used for calculating the pollution load. As there is no systematic database on pollution from industrial activities in India, the cse study made an assumption that technology in India is the same as the 1988 us technology of production. Such an assumption will lead mostly to conservative estimates as the technology used in the us industries is on average cleaner than India. 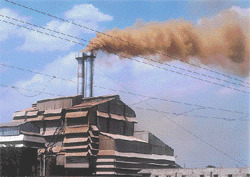 Moreover, the cse model only takes into account pollution at the production stage. But industries pollute at every stage of the life cycle of their product -- from the raw material's extraction from the Earth, its conversion into a product, the use of the product, and finally its disposal. It is also not necessary for pollution to take place only at the site of manufacture. The product can travel many miles, thus causing harm even to a user who may have never heard of the place of manufacture. Therefore, the actual quantum of pollution from industries is much higher than what has been estimated. To get an actual estimation, an indigenous database on industrial pollution for India is required. But it is a pity that no efforts are being made by the Central Pollution Control Board ( cpcb , under the ministry of environment and forests), to conduct regular monitoring and inventorising of the industrial pollution load. Whether it is an accidental leak or the emission of a poisonous gas, people are getting increasingly restive. In the face of sheer corporate indifference to environmental and health hazards, they are taking recourse to the judiciary. According to cpcb , the number of court cases filed under the Water and Air Act had grown from 2,000 in 1987 to 5,900 in 1993. However, neither the courts nor the government has come up with an effective system to make the polluter accountable. The awareness, too, is limited to those on whom the effects have become apparent or a few concerned citizens. There is a need for public awareness campaigns led by the government. Non-governmental organisations too have a major role to play. Studies such as the one conducted by cse should be encouraged to mobilise people to ensure that pollution remains a primary concern. While stringent measures are needed to control industrial pollution, vehicular pollution cannot be controlled unless diesel consumption is brought down and the quality of diesel improved considerably. In Delhi, for instance, where the level of air pollution is the highest among Indian cities, the quality of diesel being imported can be improved. Diesel in India is the cheapest in the world. It is no surprise, therefore, that the country is also the biggest consumer. Also, eco-friendly vehicular technology, though available, is very expensive. This factor inhibits manufacturers from introducing new technology. Thus there is an urgent need to spend money to promote research to develop new, cheaper effluent-cleaning technologies, instead of generating pollution and then spending much more in cleaning it up. In cities like Delhi, efforts are on to introduce compressed natural gas ( cng ) for buses by 2000. At present, there are only seven cng outlets. This is expected to rise to about 100 by 2000. One good move the government made was to phase out lead in the capital. But while enough was being said about unleaded petrol being lead-free, mum was the word on the carcinogenic benzene content in the "green" fuel. The Delhi government could not be misleading its public more effectively. Industrialisation is one of the key components of modern development. But there is a need to find the right way, to blend technology, environment and progress, and people's needs. In India, many of the problems are noticed only when it is too late to undo the damage. Technological developments have provided human beings with enormous conveniences in the West. But what we have to be clear about is that prior to the 1950s, the environment in the West was highly polluted from the heavy use of metals and chemicals. It became difficult to breathe in London and Los Angeles. However, over the years, the West has been able to reduce some of its pollution only because of enormous investments and social discipline. For instance, in California, usa , permits are issued to industries depending on how much they pollute. Unannounced inspections are carried out and defaulters are fined heavily (see interview: Small steps... ). If India tries to copy the Western model without supporting investments on pollution control measures and social discipline, it will cost millions in terms of heath and environment damage. There are, therefore, two challenges ahead of us: to improve the "ecological efficiency" of our industries, that is, we produce more while using less resources. But the tougher challenge would be to build a sufficiency revolution: learning to make do with minimal resources. Better late than never, everyone should realise that prevention is, indeed, better than cure. We are grateful to Ranjan Bose of Tata Energy Research Institute, and Carter Brandon of the World Bank for providing technical help for the cse study. The study was conducted by Priti Kumar of cse and Sujata Bhattacharya of the Jawaharlal Nehru University.